GANGNEUNG, South Korea -- The Americans' gold medal drought is finally over. 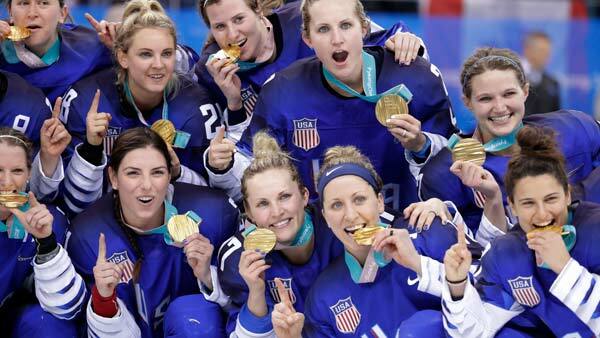 They needed the first shootout in an Olympic women's final to do it, too. The Americans piled over the boards, throwing gloves in the air before huddling and hugging on the ice - 20 years after the women's last gold medal in women's hockey and 38 years to the day after the men's famous "Miracle on Ice" victory over the Russians in group play at Lake Placid. "I can't put it into words," defenseman Kacey Bellamy said. "This whole year is for everyone that came before us. This is for Julie Chu (former USA team captain) and for all our families at home, the schools that we went to, everyone supporting us." Lamoureux-Davidson's shootout goal was the talk of the game. She feinted a wrist shot, then drew Szabados out of the net by faking a backhand and came back to slide the puck past Szabados' outstretched leg into the open net for the clinching score. "Not everyone can take the pressure like that and she took it like a champ," she said. It only made the lack of gold at the Olympics all the more noticeable, and Canada has been in their way since losing the inaugural gold in Nagano in 1998. Canada had won 24 straight Olympic games to go along with those four consecutive gold medals - a streak of success in a women's team sport second only to the U.S. basketball team's current streak of six straight gold. U.S. coach Robb Stauber went with Rooney in net for the biggest game of her career - the goalie for each of the three wins against Canada last fall during a pre-Olympic exhibition tour. Canada had Shannon Szabados in goal for her third Olympic gold medal game, and her teammates made her job very easy by keeping the puck in front of Rooney for most of the first period by dictating play. The Americans couldn't use their speed or get organized even with two power plays until Sarah Nurse went in the box for interference late in the period.